Santana Biography, Discography, Music News on 100 XR - The Net's #1 Rock Station!!! The middle child of seven children, Carlos Santana was born in Aultan de Navarro, MEXICO, on July 20th 1947 and raised in Tijuana where he started studying and playing guitar; as a young boy, Santana began performing with local bands in clubs and bars. In 1961, he left the Mexican border town and moved Stateside to San Francisco where five years later formed Santana Blues Band. The original nucleus of the band comprised Carlos Santana, keyboardist+singer Gregg Rolie and bassist David Brown; by early 1969, the band's name was shortened to Santana and the group was signed to Columbia Records; with the addition of drummer Michael Shrieve, percussionists Jose Areas and Michael Carabello, Santana recorded its first album, the astonishing eponymous debut reached the #4 on the U.S. Pop Albums chart selling over 2 million copies and spawning two charting singles in "Jingo" and the top 10 hit "Evil Ways". The group second album, "Abraxas", which arrived in September 1970, enjoyed a 70-week chart run in the U.S. Pop Albums chart peaking at #1 and spawning such Latin-Rock staples as the top 5 hit "Black Magic Woman" and Tito Puente's "Oye Como Va", #13 on the Pop Singles list; "Abraxas" eventually sold in excess of 4 million copies. The following year the band recorded "Santana III", after the addition of the seventh member, Bay Area guitarist, Neal Schon; this album shot to #1 upon its September 1971 release, it featured "Everybody's Everything" which rose to #12 slot on the U.S. Pop Singles chart and the top 40 hit "No One To Depend On". Almost exactly a year later, Santana released "Caravanserai", this album marked the end of this particular line-up as both Rolie and Schon opted to form a new band, Journey; the record failed to match its predecessors commercial success though it did sell a million copies and barely cracked the U.S. top 10. Carlos Santana released two more albums in 1972, the million-seller "Carlos Santana & Buddy Miles! Live!" and John Coltrane's tribute "Love Devotion Surrender", in collaboration with Jazz-fusion guitarist Mahavishnu John McLaughlin. In the fall of 1973 Santana offered the band's fifth album and its first with the renewed line-up, surprisingly "Welcome" was a commercial failure, it reached #25 in U.S. Pop chart and stalled at gold sales. 1974's Columbia Greatest Hits package restored the group to their multi-platinum status; that same year Carlos Santana released his third duet album, "Illuminations", recorded in collaboration with John Coltrane's widow, harpist+keyboardist Alice Coltrane, the band's sixth effort, "Borboletta", followend in October reaching the U.S. top 20. "Amigos" arrived in the spring of 1976 and featured a marked progression towards a more accessible sound, the set hit #10 on the Pop Albums chart and also included the first charting single in four years, "Let It Shine". "Festival", which barely cracked the U.S. Top 30 Albums chart just nine months later, was the first LP in which none of the original band members, with the exception of Carlos Santana, played on it. October 1977 saw the release of the double-album, "Moonflower", the set debuted at #10 on the U.S. Pop chart spawning the smash "She's Not There" which hit #27 on the Pop Singles chart. One year later Santana and his band returned with "Inner Secrets", this album didn't make much of an impression in the U.S. reaching a modest #27 on the National Pop Sales chart although three singles broke into the official top 100 chart including the #32 "Stormy", "One Chain (Don't Make No Prison)" and "Well All Right". At the beginning of 1979, Devadip Carlos Santana released his first solo album, "Oneness Silver Dreams Golden Reality", to comparatively little attention; the next Santana band studio album, "Marathon", which appeared later that same year, reached the #25 on the U.S. Top 200 LPs & Tapes chart and included the top 40 single "You Know That I Love You". Once again adopting Devadip Carlos Santana, he recorded his second so-called solo album, "The Swing Of Delight", which was mainly a Jazz-Rock affair; released as a double-LP in August 1980, the set hit #8 on Billboard's Jazz Albums chart but sold disappointingly. 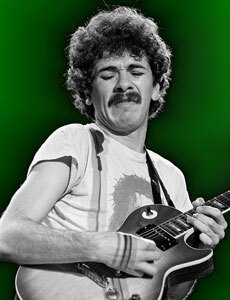 He re-entered the Pop-Rock realm with the rest of his band for the twelfth Santana album, "Zebop! ", it soared to #9 on the U.S. Top 200 LPs & Tapes chart upon its spring 1981 release, while his rendition of Russ Ballard's "Winning" shot to #2 on Mainstream Rock chart and reached the #17 on the Pop Singles chart; the record produced two more minor hits: "The Sensitive Kind" and "Searchin'". The following year, Greg Rolie briefly returned to the fold co-producing "Shango", which peaked at #22 on the U.S. Pop Albums chart and spawned two Mainstream Rock top 20 hit singles in "Nowhere To Run" and "Hold On", the latter of which rose to the #15 on the Pop Sales Singles chart. In spring 1983 Carlos Santana released his third solo album, "Havana Moon", debuting at #31 on the Top 200 LPs & Tapes chart. "Beyond Appearances" followed nearly two years later, the fourteenth group's album barely made the top 50 in U.S. backed by "Say It Again" which hit #15 on The Mainstream Rock Tracks chart; the aforementioned single was Santana's final Billboard Hot 100 entry until "Smooth", in 1999. February 1987 saw the release of "Freedom", the set featured the Mainstream Rock minor hit "Vera Cruz" and the band's commercial decline continued, with the album getting to only #95 on The Billboard 200; eight months later Carlos Santana released a new solo effort entitled "Blues For Salvador", the album's title-cut won a Grammy for Best Rock Instrumental Performance in early 1988. Following the 20th anniversary reunion tour to promote 1988's 30-track greatest-hits set "Viva Santana! ", Carlos Santana reorganized the band as a sextet and recorded "Spirits Dancing In The Flesh", the group's final studio album for Columbia Records; it reached the #85 on The Billboard Top 200 chart upon its June 1990 release. "Milagro", the band's first album for Polydor, arrived two years later, but it failed to crack the top 100 of The Billboard 200 chart. Carlos Santana, his brother Jorge and his nephew, Carlos Hernandez, all got together to record an album entitled "Santana Brothers" which stuttered at #191 on The Billboard 200 chart upon its September 1994 release. In 1998, Carlos Santana was immortalized in the entertainment world with a star on the Hollywood Walk of Fame and the following year he signed with Arista Records, where he was reunited with mentor Clive Davis, thirty years after originally signing his very first major label contract with the executive at Columbia in 1969. Their first effort was "Supernatural"; the 36th album of Santana's career featured an array of guest stars including Eric Clapton, Dave Matthews, Everlast, Eagle-Eye Cherry and Rob Thomas among others; Matchbox Twenty's frontman co-written and sung the first single off the CD, "Smooth" which hit the top 10 of The Mainstream Rock Tracks chart, proved its staying power with a record 12 consecutive weeks at #1 on U.S. Hot 100; the second single "Maria, Maria" also rocketed to #1 on The Billboard Hot 100 and spent ten weeks there while "Supernatural" rose to the top slot of The Billboard 200 Albums chart and reached the #1 position in several countries around the world. It won nine Grammys at the 42nd Annual Grammy Awards in February 2000, including Album Of The Year and Best Rock Album; Record Of The Year, Song Of The Year and Best Pop Collaboration for "Smooth", Best Rock Performance for "Put Your Lights On", Best Rock Instrumental Performance for "The Calling", Best Pop Performance for "Maria, Maria" and Best Pop Instrumental Performance for "El Farol". 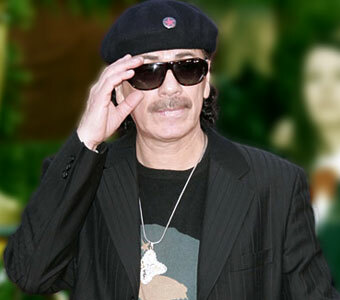 Santana returned in October 2002 with "Shaman", the record shot to #1 on The Billboard Top 200 Albums chart highlighted by the single "The Game Of Love" performed by Michelle Branch, the track peaked at #5 The Billboard Hot 100 and won a Grammy for Best Pop Collaboration With Vocals; a second single, the Nickelback's Chad Kroeger-sung "Why Don't You And I", hit the top 10 of The Billboard Hot 100 in late 2003. The next Santana album, "All That I Am", released in November 2005, includes the singles "I'm Feeling You" featuring Michelle Branch and "Just Feel Better" recorded in collaboration with Aerosmith's Steven Tyler.